Profile: Swindon based Luke joined Marine in early August from Wealdstone where he played in the National League South League. He had an injury-ravaged campaign for the Stones last season and is now keen to get back on the pitch and having moved to Swindon he has decided to join Marine. 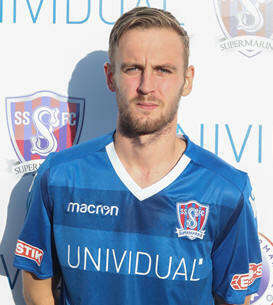 He signed for Wealdstone from Hungerford Town in August 2017, just after manager Bobby Wilkinson made the same move. He proved to be one of the most influential midfielders in the National League South whilst at Hungerford, where they just missed out on the play-offs in 2017, renowned for his creativity and work-rate. Prior to Hungerford he made over a hundred appearances for Hayes & Yeading. He could prove to be a valuable and crucial signing for Marine this season.